Christiaan Nagel is a street artist known for his oversize mushroom sculptures made from polyurethane which he places high up on buildings. They stretch as far as London, New York, Barcelona, Berlin and Cape Town. He was born in South Africa and grew up in Durban. As a part of Durban huge surfing community he lived as a member of this subculture of surf and skate for most of his life. Since his artistic beginnings, he attended art classes and one of his first accomplishments was ABSA bank award for kids that he got when he was seven years old. In high school he worked and studied under the guidance of Scottish artist Fiona Kirkwood. During that period, he experimented with range of popular mediums such as drawing, charcoal, painting and sculpting. In following years he went to Pretoria University where he got a degree in Psychology and Philosophy, which as he states was a “more important subject as art should say more about ones social-historical context rather than be an art of precision. ” He learnt about Zigmund Freud and his studies of the subconscious mind and dream content which in his own word was a subject that influenced his work in great amount. Through his life, besides constantly painting, he was also involved in woodwork. He built his first electric guitar when he was 16 as for he was a member or trash metal band called “Severed Myth”. Guitar required airbrush and the light bulb turned on. In 2005 he had his first solo exhibition which ended in him selling all of his artwork. He then jumped into a phase in his life that was exhibiting his artwork throughout the South Africa as he later decided to pursue his career as an artist. One of the turning points for this decision was a call to do a show in Godge Street in London in 2007. He says that polyurethane is his paintbrush. He makes nozzles very thin so he can manipulate them more easily and focus on the details. He works in quick manner, sometimes using molds. First mushroom was born in 2009 and was inspired by talk he had with a one of the famous surfers in SA, who led him to the idea of using polyurethane to make a head for the mushroom. Idea was instantaneous, and it seemed universal and understandable. He didn’t care for the fact that he needed permission to install artwork on top the buildings so he gathered a crew that would support him in his artistic quest, to make mushrooms a part of bigger narrative and include it in a wider context so it can be communicative form for every day people. 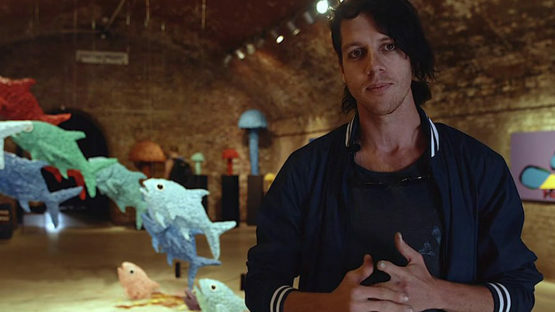 One of his recent exhibitions is named “The FI of The Underworld” and it follows the story of metaphysical fish swim though physical objects and it’s all based on a mushroom trip, a hallucination. In addition to mushroom being a part of bigger narrative, he’s hoping to release a fantasy book that deals with subject of concept of perception, consciousness and dream content. His dream is to build Mushroom Land, as he says. It will be a theme park that’ll provide a basis for his story and it’s characters, of course with mushroom involved. He’s currently working on this project and the latest phase is finished mega mushroom, 7 meters high, and there’s ten more to come.